Since my first blog was really an introduction to tell everyone a little bit about myself and what I make, I thought I would actually show you what I have been making this week . I hope to settle down into blogging once or twice a week, I don’t want to bore you all and scare you off with my musings, that’s not to say that I won’t be visiting lots of other blogs for inspiration and enjoyment. I loved adding the bugle beads on to give the effect of sprinkles, and it was a good reason to order more for my stash. 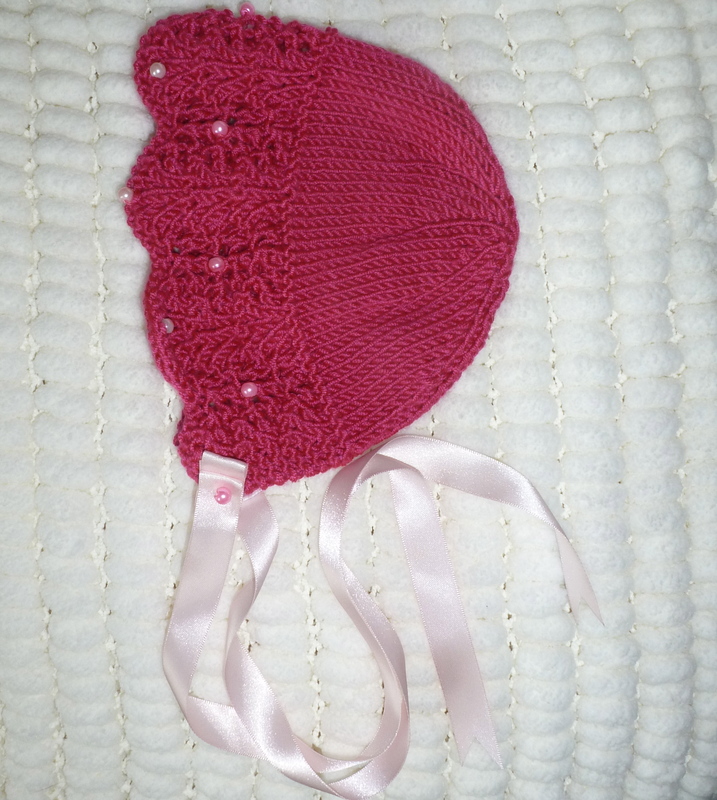 Next I made a baby bonnet in a lovely “fan and feather” pattern and using a really pretty fuchsia coloured King Cole yarn. Again this is 0-3 months and once again I had to add some beads…. And my final work in progress is quite pathetic…hardly worth showing, can you guess what it is yet? Don’t know about “Tricky Little Stitches”, these are tricky little words! 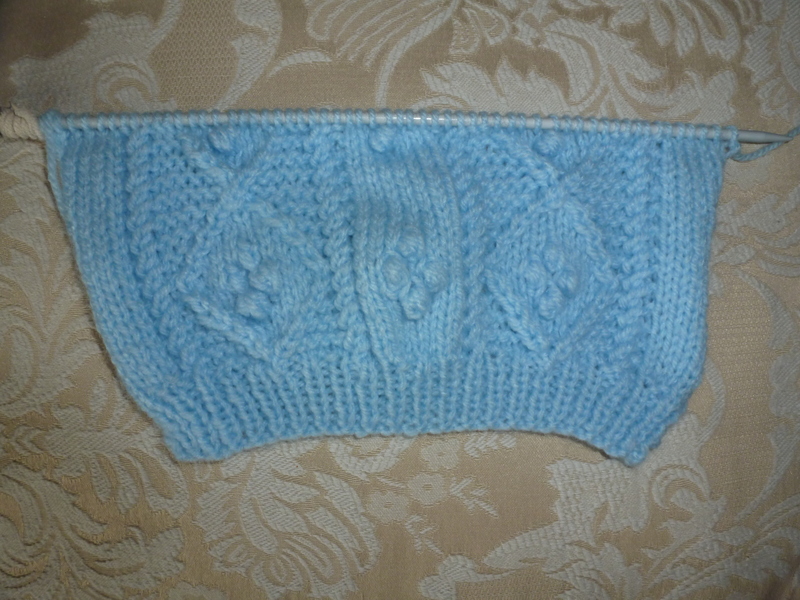 Having started knitting at the age of 15 (only a mere 31 years ago) I was quite happy to knit baby clothes for family and friends. Eventually my own three children came along and the poor things were all sent off to school in hand knitted jumpers, rather than the shop bought ones that lots of their friends were wearing. Once they were able to voice their opinions, and were tall enough to argue with me, I had to find another outlet for my knitting and quite by chance came across American “reborn” dolls, for those of you not in the know they are dolls that were altered to look and feel like real human babies. Now the Americans were really into the swing of this by the time I happened upon it, but as usual we were lagging behind and the dolls were only just becoming popular here. A kind lady offered to make me a doll, which was to look like my daughter, and in return I knitted her several outfits of her choice, which she would dress her creations in and then sell the fully dressed dolls. For one reason or another, not many American ladies seemed to hand knit, and so I began making outfits to order and became so busy I had quite a long waiting list. Unfortunately about 6 years ago became unable to knit, due to an injury and with great regret had to lay down my needles. Sad as it may sound, it felt like I had lost an old friend. Recently I attended a craft fair with my sister who is an immensely talented lady, she makes the most amazing handmade cards, (why not pay her a visit at Baileyrosy.com ) and although the wool and knitting needles were calling my name, I decided to attempt something that I have never tried before and which I had always secretly wished I could do, the art of stitching. 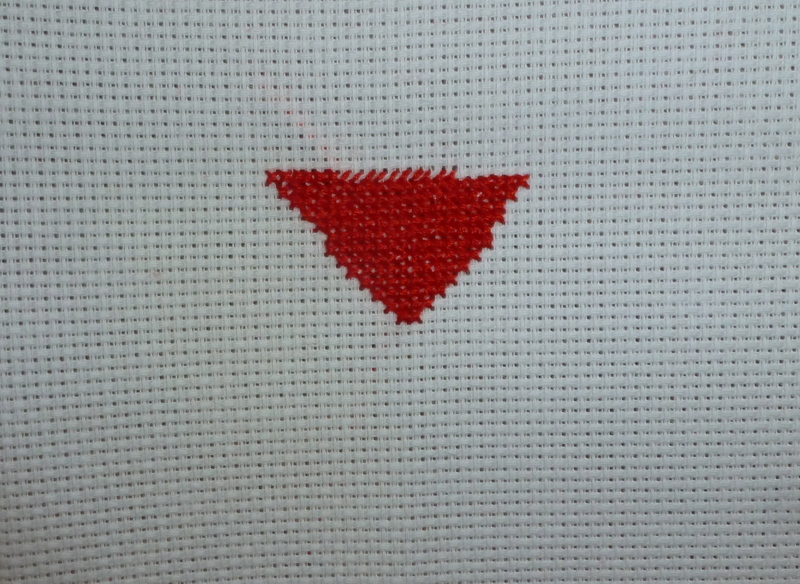 After receiving some advice, I started with long stitch, and was instantly hooked. It was basically like painting by numbers but with thread, and I wished that I had tried it years ago, it was so much fun and really quick and easy to do. I quickly became hooked and found a lovely series of seasons by Anchor, each one portraying a different view through a window, These were trickier designs, with LOTS of detail, and to top it all there were some mistakes in the printing, which I had to work out. To be honest, I considered there only being 3 seasons in a year, as “summer” was proving impossible, but I decided that changing the whole thinking of millions of people would be slightly trickier than working out the problems and my persistence paid off, the four seasons are now complete and gracing my hall. I am immensely proud of myself, big pat on the back to me! I am now even braver, having begun to cross stitch, which is even more satisfying, and I have decided to share my skills by producing hand stitched samplers for births, birthdays, weddings etc. These will be personalised with names dates etc. In amongst all this I decided to try knitting again, and have knitted lots of lovely brooches, onto which I have hand sewn beads to make them look a little more unusual. I am loving all this craftiness and can’t believe I had 6 years of a tidy living room. My poor family are now surrounded by yarn, beads, bits of felt and lots and lots of embroidery floss. My wonderfully patient husband claims that if I committed a crime, the threads that follow me everywhere will give me away…. 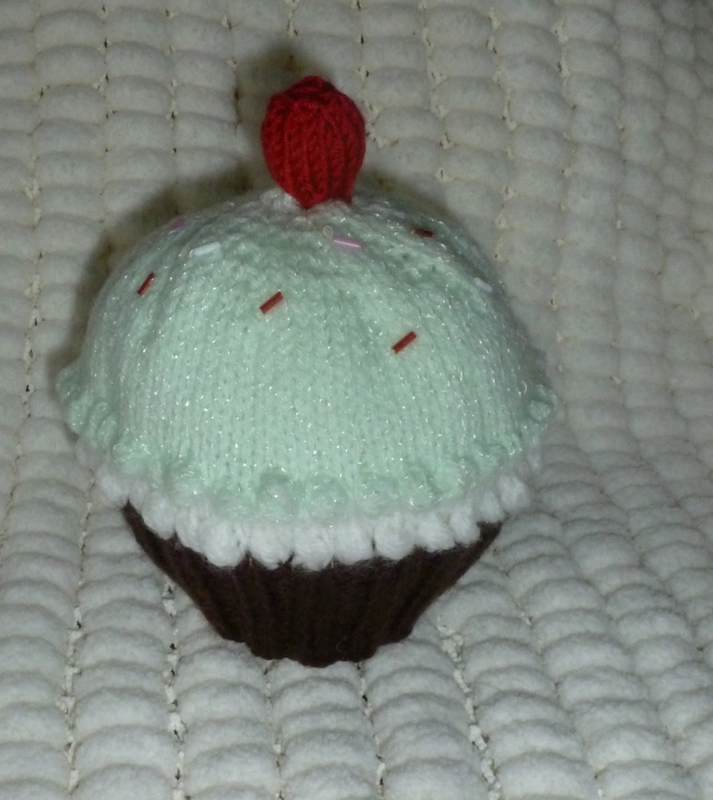 Well I hope you’ve enjoyed my first blog, all my lovely brooches and cross stitch items can be found for sale in my Etsy shop, which now include lots of lovely knitted baby hats at www.etsy.com/shop/trickylittlestitches why not pop in and have a look. Please follow me and I will show you my new creations, which I hope you will enjoy looking at as much as I have enjoyed creating them. 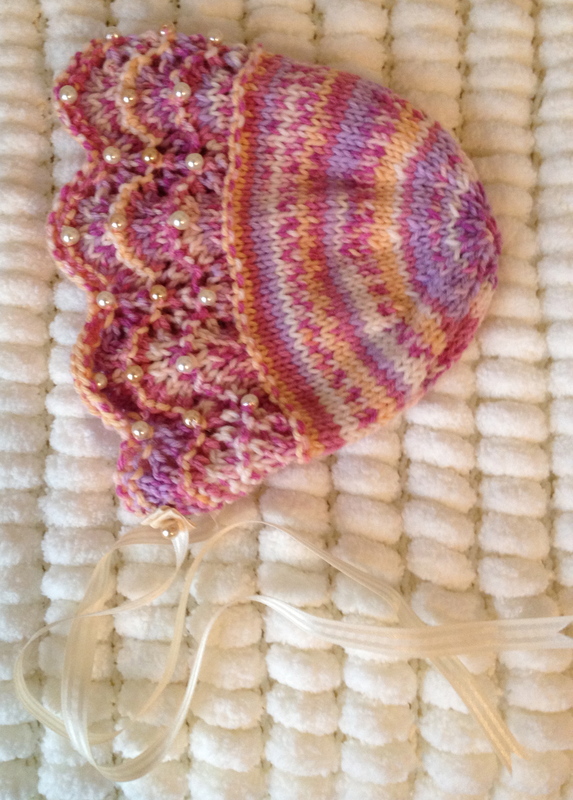 Heres a sneaky peek at one of my hats…. Finished knitting the dream, next please! 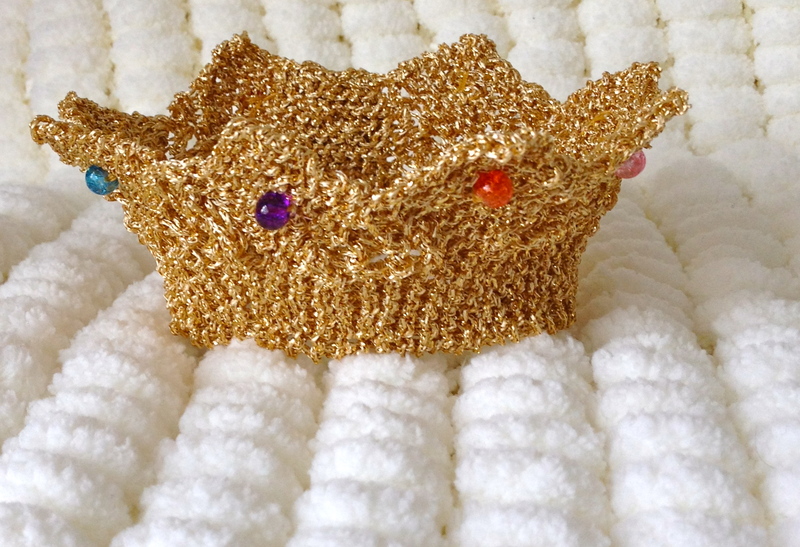 Knitting Nattering and being featured in another blog!